← Transfer Any Videos from iPhone to iMovie on Mac? In the following tutorial, we will show you how to convert the H.265/HEVC videos which recorded from Samsung NX500 4K camcorder to YouTube/Facebook supported video formats. Thus we can easily enjoy the H.265 movies on YouTube and Facebook with all of your friends. How to convert H.265/HEVC videos for sharing on YouTube from Samsung NX500? 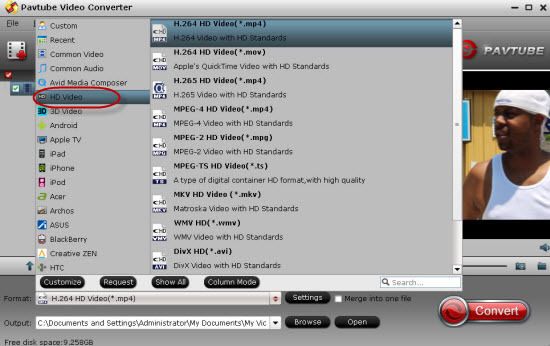 Step 1: Free download the video converter and have a quick installation. Launch the program and the click ‘Add’ Video button to load your H.265/HEVC files or you can directly drag and drop the files to the program. Note: The trial version will have a “Pavtube” on your converted files, expect for that, there is no time limitation, no virus, no unnecessary bundle apps. Or you can download the official version. Step 2. Then just click Format bar and choose H.264 High Profile Video(*.mp4), H.264 Main Profile Video(*.mp4), or H.264 Baseline Profile Video(*.mp4) from “Common Video” as the target format. Or you can go to HD Video> H.264 HD Video(*.mp4), which will reduce the quality drop of your raw H.265 files to the least. Tips: Click Edit button and you can trim, crop or adjust the H.265/HEVC videos with the built-in video editor to get the very part and effect of the movie you want. Besides, by clicking the Split icon in the main interface, you can cut your files according to time length and file size. Step 3.After all necessary settings and editing, click Convert to start the conversion. When the conversion completes, you can click Upload Video on YouTube to upload the converted H.265/HEVC video files to YouTube without any troubles. Let’s enjoy the Samsung NX500 H.265 recordings on YouTube and Facebook so nicely.